After Robots was recorded January in Bloomington, IN as BLK JKS traded a South African summer for winter in America and burrowed in for marathon recording sessions of one live take after the next. Brandon Curtis of Secret Machines returned to join the band at the controls and Hypnotic Brass Ensemble appears on several tracks with the swagger of aggressive horn stabs, but throughout After Robots is an original BLK JKS affair””a distinctly South African vision of rock’s global travel and the possibility of what it can sound like from here on out. 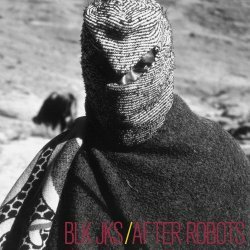 After Robots, the new full length album by BLK JKS is due out on September 8, 2009 on Secretly Canadian. On that very same day, the band will be in town to play an album release show at S.O.B.’s with Highlife and Janka Babay (Buy Tickets). If you pre-order the new album via this link you’ll receive a free 17 x 22 poster featuring the album artwork and a free download of the limited edition remix 12″ featuring Osborne. After Robots artwork, track listing and initial BLK JKS 2009 US tour dates after the jump.